Shot on a very cold November morning as the sun was obscured by the clouds and they sat over the city. The frame really changed as the sun poked through the clouds. To see the sky light up as it did this morning was a gift. The first that seemed to emanate from the city was astonishing. Sunrise shots are always different in the city of Chicago. When you are shooting downtown Chicago around Sunrise you have to get there early enough to catch the pre-sunrise light, just like the post sunset light, it can sometimes be the best time to capture the city. 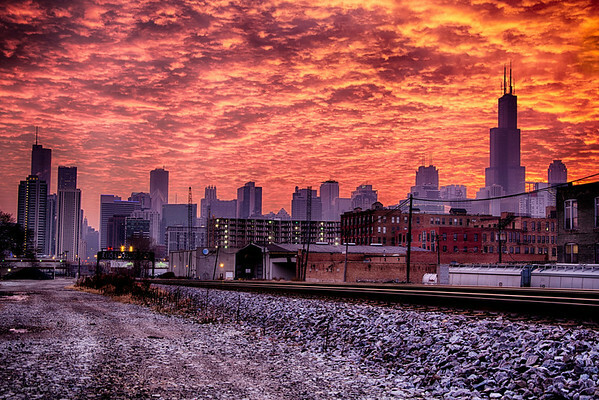 Shot 12-1-13 as the sun rose over the city of Chicago, Illinois. Some of the most beautiful photography I have seen. I have been to Chicago several times and I can place my views with your photography.